It’s become very apparent of late that, down in the goat paddock, our young ladies thoughts are (without getting all Alfred, Lord Tennyson on you) lightly turning to thoughts of love. Obvious signs aside, the whole mood of the paddock has shifted as the girls surrender to good, old fashioned bouts of of The Juliets. Geraldine, in particular, has it bad, spending a couple of days last week staring soulfully down the garden path periodically emanating plaintive whickers. In short, there was no hiding from it: in the interests of next year’s milk supply we needed to find a goatie beau and, after last years disastrous attempt at initiating proceedings, it had been decided to offer the suitable suitor board and lodgings in return for their *ahem* undivided attention. Young Bob fitted the bill perfectly. 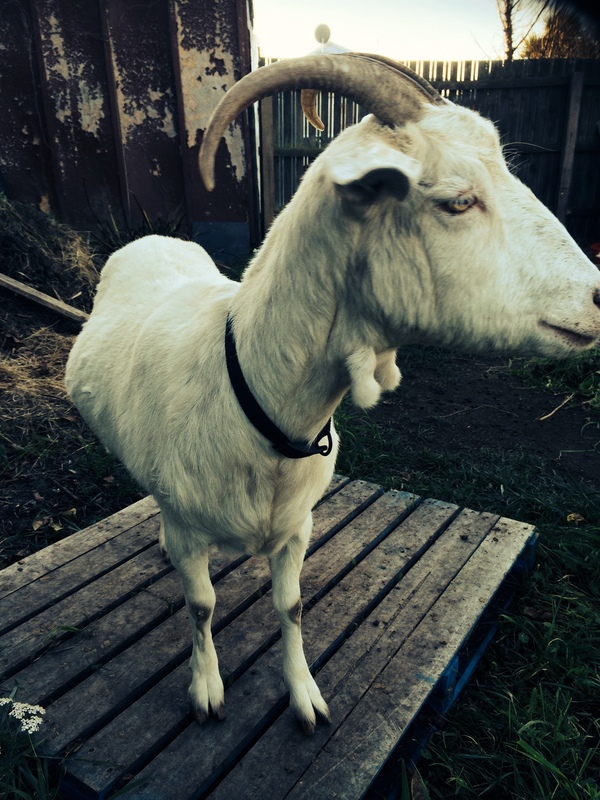 today Bob arrived on The Homestead. As we crept back down the path, leaving them alone to sort out the accommodation arrangements, we allowed ourselves to bask in a moment of quiet pride. Fingers crossed, next years milk supply is sorted. 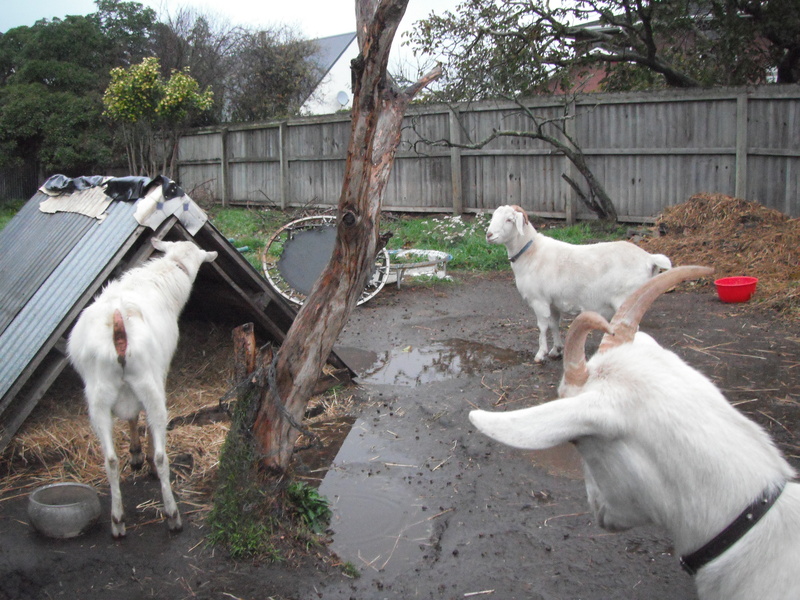 This entry was posted in Goats, Union Homestead and tagged Aotearoa, breeding, buck, Christchurch, doe, Goat, goat kids, goats, Homestead, Homesteader, homesteading, milk, New Brighton, New Zealand, Otautahi, smallholder, smallholding. Bookmark the permalink. You write so well, I enjoyed the account of the future of your milk supply. Thank you, I’m glad you enjoyed it. 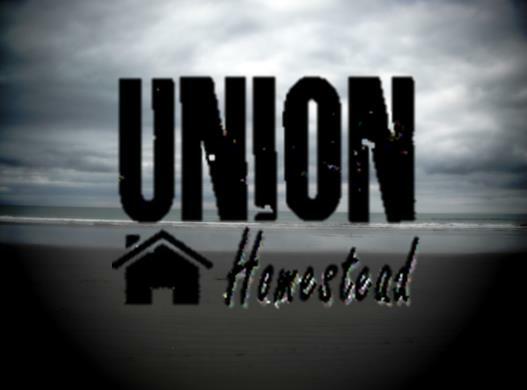 Let’s hope it all works out as intended; as you know, this isn’t always guaranteed for us Homesteaders. Haha, he’s got some classy moves that Bob. I’m certain that in no time he will seal the deal. Thanks for sharing this borderline scandalous affair. Oh my. 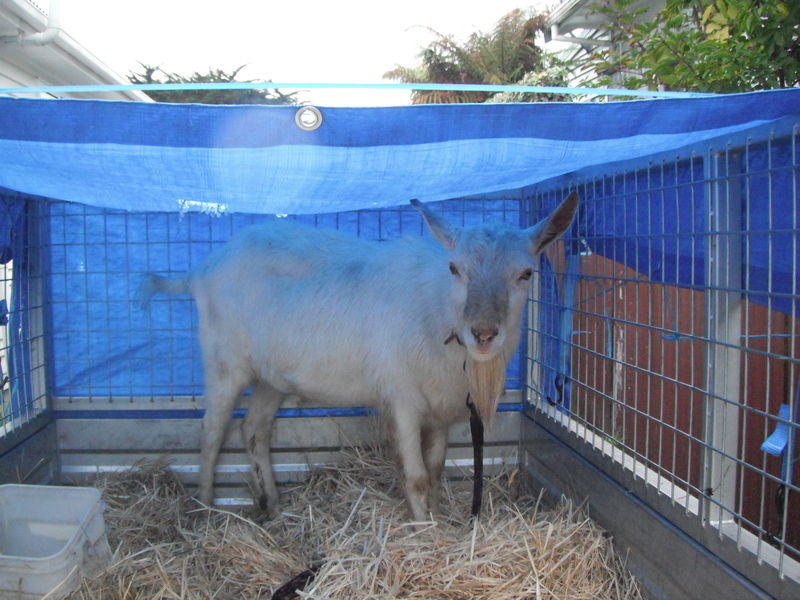 The only experience I have of billy goats is the one that used to live on a boat down the bottom of our village, and would be walked on a leash every day up to the park that surrounds the library so that it could graze while it’s owners took turns coming into the library to spend time on the internet. That goat was a cranky ornery thing, and had a special antipathy for dogs, which accompany many of the little old ladies that totter up the path to the door of the library and then tie their dear treasures to the railing, not realizing there is a ferocious billy lurking in the rhododendrons just the other side of the door. They didn’t tell me about billies when I took on the library job. And smell! Peeeuuuwww. I think they’ve moved their boat thankfully, because we haven’t seen them in a while. No – haven’t seen it yet, though I’ve had it home a couple of times from the library fully intending to watch it. Have you seen Second Best Exotic Marigold Hotel? The library doesn’t have it yet, so I guess that gives me time to watch the first one still. I will make sure to watch for the goat curry. Have you seen One Hundred Foot Journey? Lots of curry (I don’t think any of it was goat). I don’t watch many movies – can’t stay awake long enough, and OHFJ was longer than I thought it would be, but worth the effort. Chuckling. Loved this one. 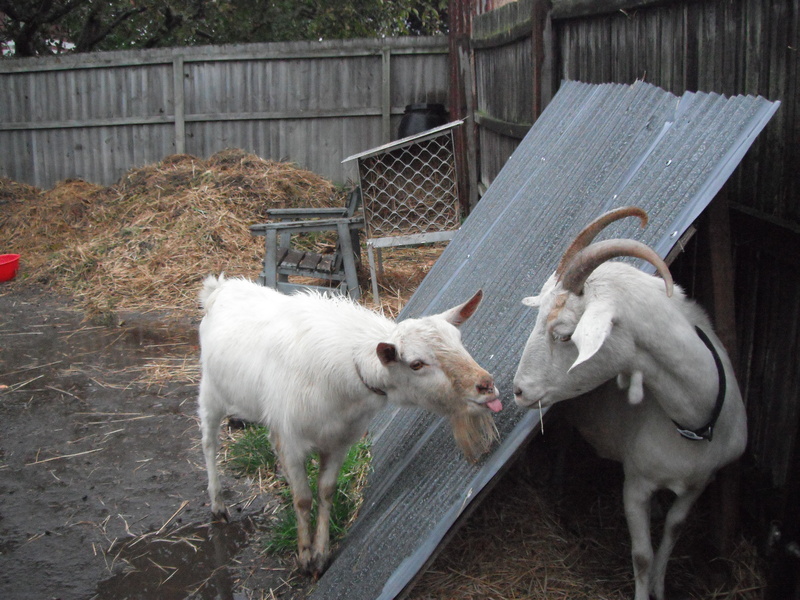 The pics of goat love are cracking me right up. Super glad you kept us out of the nitty gritty. Haha!